On Saturday, May 30, 2015, Chantilly Bible Church will host a FREE 1-day Christian Filmmaking Boot Camp sponsored by NoVA Christian Film. 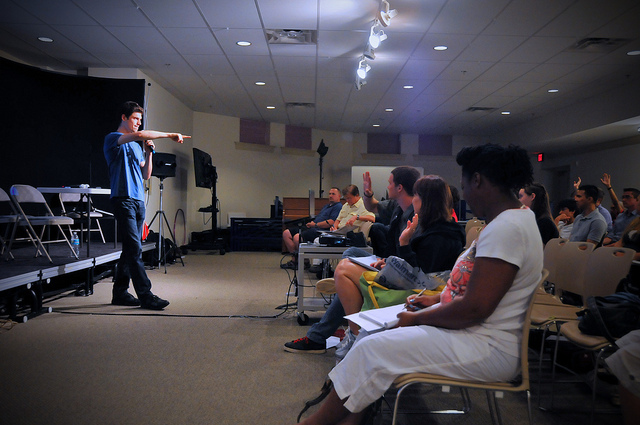 The speakers are experienced film & video professionals in the northern Virginia area who love Jesus. They will cover essential aspects of independent filmmaking, such as acting, directing and screenwriting — and will end the day with an actual video shoot you can participate in or watch! This boot camp is perfect for any Christian interested in learning how to make low-budget films, pursue a career in film or television, or discover ways to impact Hollywood with the message of Jesus Christ. If you have a desire to be behind or in front of the camera, please join us for this one-day filmmaking boot camp taught by experienced Christian professionals! Free pizza & bottled water will be served for lunch. You’re welcome to bring something else to eat/drink, if you wish. Please feel free to bring head shots, business cards, DVDs or other marketing materials to give away during the event. We will have a networking/marketing table specifically for this. For more information on NoVA Christian Film, please visit novachristianfilm.com or join the Facebook group at facebook.com/groups/novachristianfilm. *Speakers and topics are subject to change. **Feel free to bring your own DSLR to learn on, or just watch.